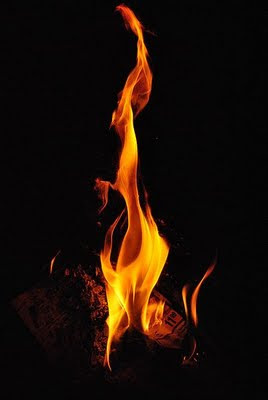 Kindling: Are You Scared of Your Own Fire? Are You Scared of Your Own Fire? I have always loved this line from a song by Canadian singer Bruce Cockburn: "When the fire burns inside you, but you jump at every spark." Often we are afraid of our own success. We see the passion and possibilities and turn and run in the opposite direction. Stay near the fire, no matter how it scares you. That's all you have to do. You didn't create the fire, you simply added a twig or two, perhaps a bit of dried moss, a dry branch--or one ordinary log. Do your part. Feed your writing one day at a time, ten minutes at a time, or one page at a time. Feel the heat and don't run away.